"We got the brochures yesterday and they look beautiful. The client and all her team were very impressed with the printing, paper quality and packing." Choosing the right paper for your printing project can make a huge impact on the final product. From final presentation to cost, paper stock is the core of your printed piece. Here are some tips for picking the right paper for different types of printed materials. 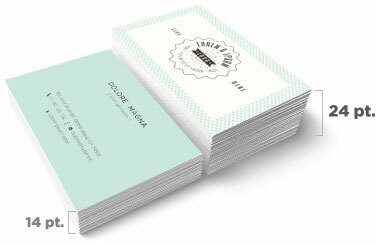 Business cards should catch the eye, be memorable, and then get out of the way. When your possible customer goes to find your card later, it should look good. There is a large range of paper stocks for business cards, and you can even get cards printed on plastic or other non-paper substrates. Pick an uncoated stock or a dull/matte stock if you want people to be able to write on your card. Uncoated stock is the best option when you want people to be able to write directly on the piece without smudges, but if you have important photos or graphics on your card they will look much more vibrant on the dull/matte stock than on the uncoated stock. Using metallic foils or metallic ink? Metallic inks should only be printed on gloss stocks, as the ink will not look metallic at all on uncoated or only slightly on dull/matte stocks. Want something that feels interesting to the touch? Use a Soft Touch® coating that makes the card feel like velvet. Request a sample; you have to touch it to get the effect. Don't waste time and effectiveness by trying to save a little money. Your business card is an important marketing tool - consider using custom features and get a great design that stands out. Learn even more about How to Choose the Best Paper for Your Printing Project. 120# (14 pt) Dull/Matte Cover when you want a final piece that has crisp text and images, while maintaining the ability to write on. 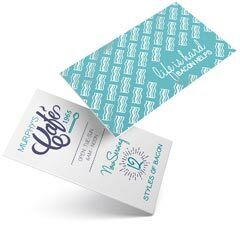 100# (14 pt) Uncoated Cover is great for business cards that you'll be writing on and for certain demographics (attorneys, financial, other professional). 120# (14 pt) Gloss Cover works best if you're using metallic inks or if you want the professional look and feel of a glossy paper. 160# (18 pt) Gloss Cover is super stiff and thicker than most business cards. Get's noticed, but you can't keep as many in your wallet. Magnet Stock keeps your message in front of your clients all year long. Our magnetic stock enables high quality printing with excellent color reproduction and will stick to most metal surfaces. Great for business cards from service industries that could be saved and referenced on the fridge. Worried about your cards getting scratched up in pockets and purses? Get free aqueous coating or an optional UV coating to add greater protection for your card and make the colors pop dramatically. Brochures, sell sheets, maps, menus and flyers can all benefit from using the right paper for the job. Plastic paper like SmartFlex® can create water and tear-proof products like maps or menus. Heavier paper is more rigid, helping items stand up when folded. 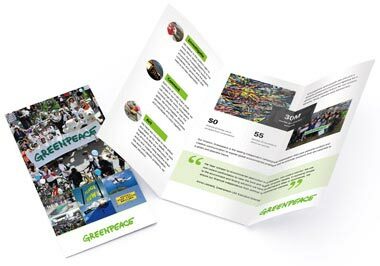 If you are folding your brochure, the maximum recommended thickness for 2 or more folds is 100# cover. If the printed piece is going in the mail, it must be the correct thickness to meet postage regulations. The number of folds affects the final thickness. Call us for advice as the 2,000 page postal regulations manual changes often! Thicker paper can make metallic foils and embossing look better, but as you go above 80# cover the amount of detail that is able to be shown in your embossed element will decrease. If you're printing a lot of materials, thinner paper is usually cheaper and could potentially have a lower mailing cost. 70# Uncoated Text is great if you want to be able to write on the brochure, and want to add more than two folds. Text stock is lightweight, this paper is similar to the paper you'd find in a book. 80# Gloss Text is your choice for brochures that need the professional look of a glossy finish, need more than 2 folds, and that should be lightweight but still strong enough to hold their shape. This is an economical and very common choice for brochures. 100# Gloss Text is a great choice for brochures that you want to feel more substantial and that will hold up better to repeated use. This is a very popular stock for brochures. 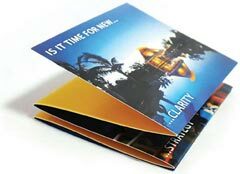 80# Gloss Cover produces a thicker brochure; it's a light weight card stock that can be folded, but might not lay perfectly flat when closed. 80# Dull/Matte Cover. This matte coated stock makes images look good without excessive shine, and can be written on with certain pens. Brochures can be protected with additional coatings, such as a free aqueous coating or an optional UV coating that provides additional protection and makes colors really shine. Postcards - especially those sent in the mail - have only a moment to get and keep someone's attention, but they do get handled, held, and read. Postcards that will be mailed have to meet US Postal Service regulations for size and thickness. In general, your postcards need to be printed on 100# cover or higher to mail. 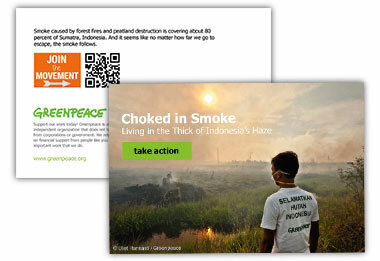 Check out our postcard mailing templates for sizes and layout tips. Thicker and larger postcards stand out, but anything larger than 6" x 11" will be require a much higher "Flats Rate" postage. 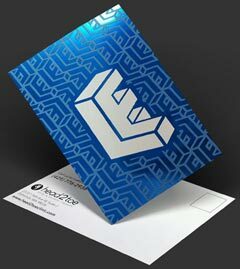 Use a UV coating on the non-address side to make your card pop with high-gloss elements while protecting the card from handling and the weather. People touch a postcard so use Soft Touch® coating on the non-address side to give it a soft, velvety feel (you have to request a sample - words don't do Soft Touch® justice). 100# Uncoated Cover. This bright white smooth #1 grade cover stock is a substantial paper, and the minimum thickness for a postcard going in the mail. You can easily write on this stock and is a great option for appointment or reminder cards. 120# Dull/Matte Cover. Our dull/matte cover is a substantial paper with a smooth, non-shiny coating. It is a heavy 14 pt stock well suited for detailed, crisp printing without sacrificing the ability to write on the paper. You can also get UV coating on the front of a dull/matte card to add pop to the side that isn't needed for writing. This is a popular choice for postcards. 120# Gloss Cover. This is one of our most popular papers, its glossy coating makes photographs and other images look beautiful. UV coating, often called liquid lamination, is a great addition to the 120# Gloss Cover for added pop and shine. Not recommended if you want to be able to write on the postcard. 200# Gloss Cover. At 24 pt, this is our thickest and sturdiest card stock. It has a glossy, smooth finish that prints well. It works really well for die cuts and foil stamping. If you're adding foil stamping or die-cuts to your postcard, you can't beat 200# cover stock. Use a free aqueous coating or an optional UV coating to protect your postcard from scratches and scuffs while making the colors pop. 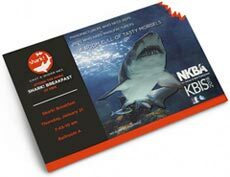 Soft Touch® coating adds a velvety feel to the card that makes it stand out and grab attention, but save some money by only adding it on the non-address side. 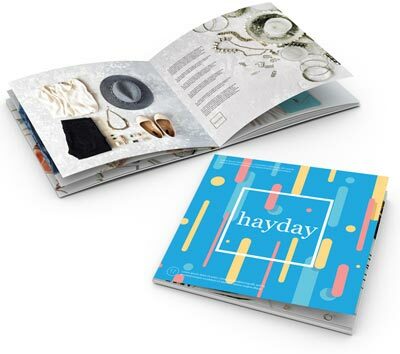 In print terminology, a catalog is anything that is saddle-stitched like a magazine, but unlike a magazine a catalog can have a range of paper types for the cover and interior pages. Catalogs are printed in 4 page increments, as each sheet is folded in half into 4 pages (front and back). Catalogs are frequently printed with a thick cover stock and thinner text stock for the interior to minimize cost. It is important to match the cover stock and interior text stock so there's consistent color and image quality. For example, if you use 80# gloss cover stock for the cover and 70# uncoated text stock for the interior pages, and you have a consistent brand color on every page, it will look noticeably different on the cover than on the interior pages. 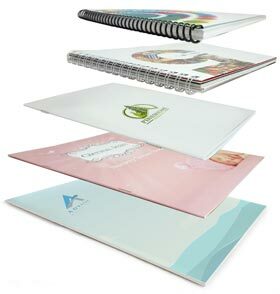 Catalogs can be saddle-stitched like a magazine, coil bound, Wire-O bound, or glued (perfect bound) like a soft cover book. Consider a high-gloss, coated paper for catalogs where art and images are important, and use an uncoated paper you can write on for product lists where readers may want to circle something or take notes. If your catalog will be mailed, be conscious of the total weight. You may need to use lighter papers to minimize the overall mailing cost. 80# Gloss Text. Standard glossy paper stock, about as thick as a quality magazine page. The shiny finish provides an excellent opaque base for four color process printing. This can be either perfect bound or saddle-stitched. Text stock, like this, is usually used for interior pages only unless weight is a factor in mailing cost. 80# Dull/Matte Text. This stock is finely coated with a non-gloss finish. It provides an excellent opaque base for easy to read, crisp typography. 100# Gloss Text. Similar to the 80# gloss text, but 25% thicker and heavier for a more substantial feel and extra durability. This paper is thick enough to be bound any way you'd like. It's sometimes used for a self-cover when cost or mailing weight are factors. 80# Gloss Cover. As a "cover" stock, this paper is stiff, about like a postcard or baseball card. This stock has a glossy finish, making photographs and other images look beautiful. Glossy cover stock is hard to write on, however. Cover stock, like this, is usually used for the cover of a catalog, or for catalogs with only a few pages. 80# Dull/Matte Cover. This cover stock is well suited for detailed, crisp printing without a shiny finish. Colors pop with dull/matte stock and it is thick enough to be bound however you'd like. Cover and interior papers can be coated with a free gloss aqueous coating or an optional UV coating to provide protection and a high-gloss look that makes colors even more vibrant. A great way to make a personal connection with your customers and prospects. We have a great selection of papers for greeting cards, note cards, announcements and custom stationery. 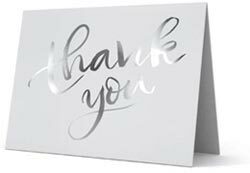 Use uncoated stock where people will be writing on the card, such as an RSVP response card, or for certain artistic effects. Gloss coated paper will resist writing and leave smudges, but this issue can be minimized by choosing a dull/matte coated stock if your images require the superior print quality of a coated paper stock. Our standard card stocks, 120# (14 pt) are optimal for embossing, foil stamping, and die-cutting, all popular options for event cards such as wedding invitations. Use textured papers such as linen, ribbed, or parchment to give a sense of luxury or class. They can be custom ordered. 120# Gloss Cover. This is one of our most popular papers. It is a heavy 14 pt stock with a glossy, coated finish. It makes photographs and other images look beautiful. UV coating, often called liquid lamination, is a great addition to the 120# Gloss Cover for added pop and shine on the outside of the card. Not recommended for cards that need to be written on. 120# Dull/Matte Cover. Our dull/matte cover is a substantial paper with a smooth, non-shiny coating. It is a heavy 14 pt stock well suited for detailed, crisp printing without sacrificing the ability to easily write on the paper. You can also get UV coating on the front of a dull/matte card to add pop to the side that isn't needed for writing. This is an excellent choice for greeting cards and note cards. 100# Uncoated Cover. This bright white smooth #1 grade cover stock is 14 pt in thickness and matches the 70# text-weight stock we use for letterhead and envelopes. You can easily write on this stock and is a great option for appointment or reminder cards or when a "natural" feel is desired. Protect your cards with a free aqueous coating or optional UV coating that provides protection from the elements and makes colors more vibrant. Aqueous Coating is a clear water-based coating used to protect your printed pieces. It provides a high-gloss surface that deters dirt and fingerprints. Aqueous coating improves the durability of any printed piece and enhances the look of images. Learn more. UV Coating, often called liquid lamination, is a highly protective, ultra-shiny gloss coating that we apply over aqueous coating and then cure on a special machine using ultraviolet light. The solvent-free UV coating provides an extremely hard finish that's chemical and abrasion resistant. It makes color and details really pop! On deep colors, it results in a stunning, almost wet appearance. Perfect when you want a durable, environmentally-friendly piece with a richer, high-end look and feel. Learn more. NOTE: UV Coating cannot be used on the addressed side of mailed pieces. Need help deciding which paper to use for your project?